Wayne Peterson: "Howard, Kenneth J. Parrotte did a piece on Lewis Strang life on your website. I am trying to get as much information as possible on the Christie Racer as it is being rebuilt. I would like to find out if any of Lewis Strang family are still alive or anyone who might have any information in regards to the Christie Racers. Looks like Lewis Strang was the Nephew of Walter Christie. Any help would be greatly appreciated! You may give my contact information out to anyone that might be able to help. Lee Stohr is a great asset and part of the team helping with the Christie project. Happy New Year to you and yours and oh ya that Beautiful Black Beast. 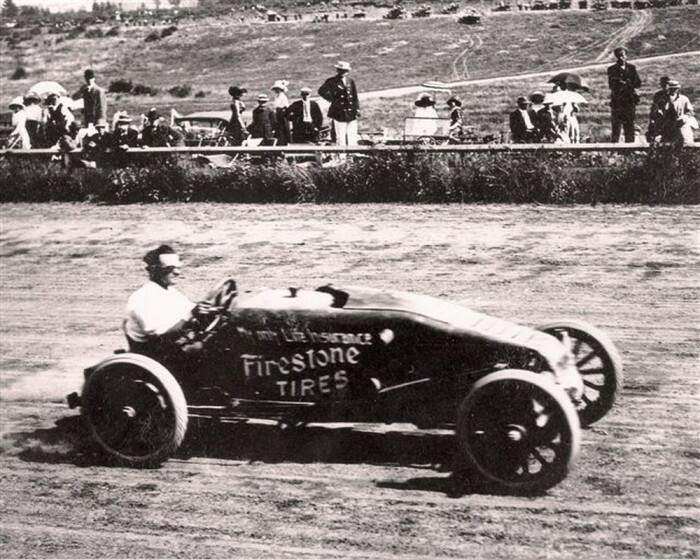 Barney Oldfield, Master Driver of the World & America's Legendary Speed King Great Great Nephew "
Wayne, first some background on your great-great-uncle's achievement. 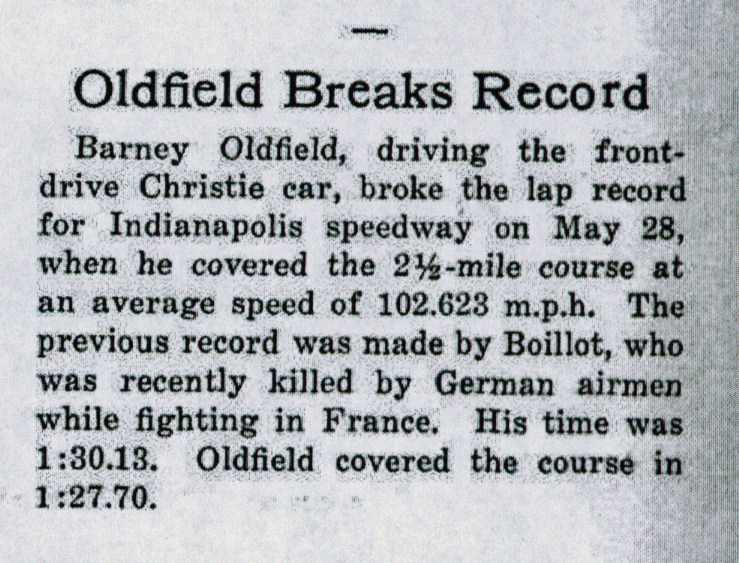 As reported in the June 1, 1916 issue of The Automobile, Oldfield broke the Indy track record during a practice run on May 28, 1916. He "covered the 2 1/2-mile course at an average speed of 102.628 m.p.h. ...in 1 minute and 27.7 seconds." Barney Oldfield acquired the biggest 140 bhp Christie and barnstormed it from coast to coast for years. In 1915 on the Tacoma boards he averaged 113.9 mph for a mile, and at Indianapolis in 1916 he set a new lap record of 102.6 mph. 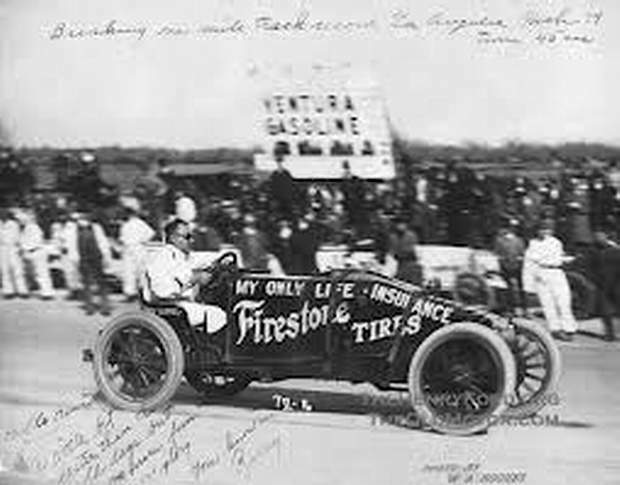 To Barney Oldfield, Establishing lap record, May 28, 1916, Car Christie, Time 1:27.70, Average 102.623 MPH, Compliments, Indianapolis Motor Speedway." I have done a lot of research on Walter Christie’s automobiles. I think 140hp is about right. One way to estimate the torque and power of these old engines is by using a formula found in ‘The Gasoline Automobile:Vol.II by Heldt(1913)’. Christie’s big 7.5” diameter pistons and 7” stroke give about 650ft.lbs of torque. You get big torque when you have a 1237 cubic inch engine ! The engine didn’t turn more than 1200rpm, and Horsepower is calculated by multiplying torque x rpm/5252. So 130-140hp might be right. 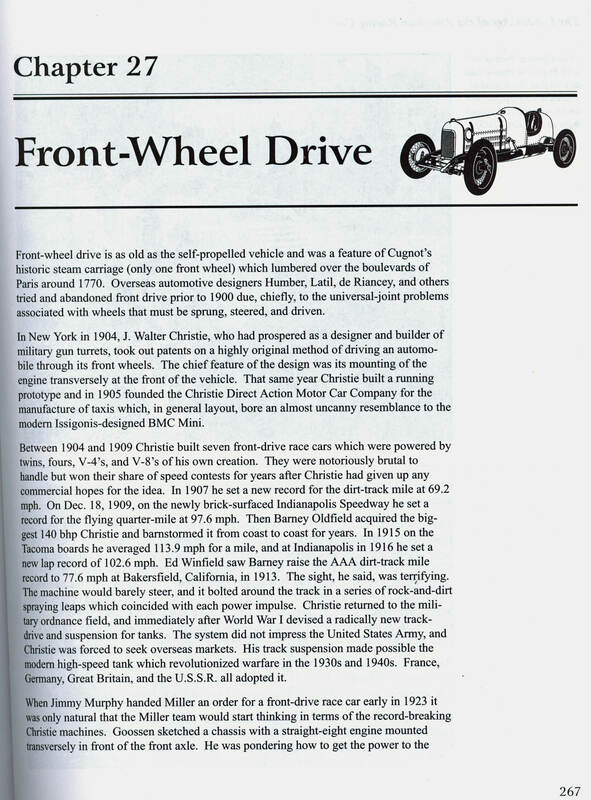 Christie’s crankshaft was sort of attached directly to the front wheels in top gear. Christie changed his final drive ratio by changing front tires sizes. Usually he carried a range from 30” to 34”. I think the ‘Oldfield’ Christie was one of the fastest cars in the world after Barney had Harry Miller do some work on it. Unfortunately by 1916 there was no place to race a car with that large an engine. So Barney used it for exhibition runs, track opening ceremonies and record breaking. The Christie was only set up to run a few miles at a time, it had no radiator. The cooling water circulated through a big tank behind the drivers seat. After a few laps, it would probably be on the verge of overheating. However, it was Walter Christie’s last and fastest racing car. It had a single overhead cam with overhead valves. Sadly, the car was scrapped in Chicago in 1919. Lee Stohr is, perhaps,THE authority on Christie automobiles. I do not know as much as Lee, but I do know a good bit about these cars and agree with the estimate of approximately 140 bhp. But—I would point out that, when it comes to track performance of a large displacement, slow turning engine, horsepower is nearly meaningless compared to torque. It is torque that governs acceleration, and it is acceleration that pulled the Christie so quickly through and, especially, out of turns. Dean is correct, the Christie engine had torque at low rpm unlike anything we are used to driving today. Also, you have to give Barney Oldfield credit for that 100mph lap in what was then a 7 year old race car. Imagine the old Christie on the bricks at Indy, with skinny little clincher tires pumped up to 80psi and no shock absorbers ! Barney rarely gets the respect he deserves for his talent and for just surviving all his years of racing! Thank you for your expertise on the Christie as there as been questions in regards to the Christie 100 MPH Indianapolis lap record and being compared as a rocket powered vehicle to the vehicles running in the 1916 Indianapolis 300 race that were more advanced than the at least 7 year old Christie. Thanks again as this information helps greatly. Do you know what the comparison is on the torque of the race cars of the 1916 Indianapolis 300 and the Christie? I am trying to compare the cars of the 1916 Indianapolis 300 to the Christie. I know that the Cristie engine was approx 1,237 cubic inch compared to the 300 cubic inch of the qualifying 1916 Indianapolis 300 race cars. What I have read the cars that raced in the 1916 Indy 300 had over 100 HP with a lighter weight engine compared to the Cristie 1,237 cu. in. engine but had comparable HP. The 1916 race cars were much more technically advanced than the Christie. The winning Peugeot car had twin overhead cams with 4 valves per cylinder. They won everything in European Grand Prix racing and were widely copied by almost everyone. I think they were about 4.5liters or 274cuin. Horsepower was about 112 at 2800rpm. I am calculating torque at about 230ftlbs. They had shock absorbers by 1916 and probably better tires than the Christie. One thing that Christie had which no one else had was independant front suspension. I doubt the Christie car was any heavier than the other cars. Christie’s 1906 racer weighed 1780lbs during the Vanderbilt trials. It had a smaller engine than the 1909 car, but I believe most 1916 race cars were in the 2200-2500lb range. 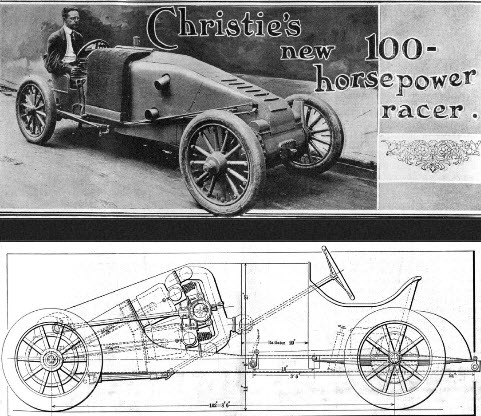 The 1909 Christie was a marvelously compact and well-packaged engineering design. Thanks again for your expertise on the Christie as this information clears any doubt in my mind of Barney Oldfield 1916 Indianapolis lap record over 100 MPH in the Christie. Best regards and keep American history alive. The is no doubt that Barney turned that 100mph lap. Firestone Tires took out ads to celebrate the fact afterwards. And it was widely reported in the press at the time. I have a scan of the Firestone ad if you want it. Of course the lap was not official because the Christie was not entered in the Indy race. The Christie engine was too large, and it could never have run 500 miles anyway. Harry Miller also ran an ad promoting the use of his carburetor on the Christie’s 100mph lap. I’ve got a copy of that too. I have a good number of photos of the Christie vehicles run at Datona. A good number of years ago I bought out Floyd Clymers archives and was able to obtain thousands of photos. These were very impressive vehicles. I would love to have the Firestone ad or any other information you would like to share and thanks again for all your help. 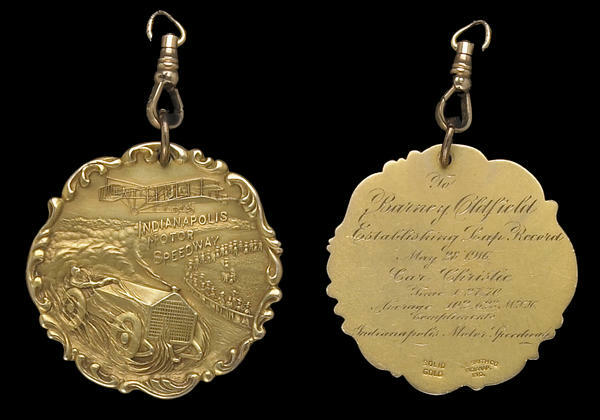 I have researched a lot of information and fully understand the rules that the Indianapolis Speedway have and why Barney Oldfield lap record was not official as he was not running a qualified 1916 Indianapolis 300 race car, But the fact is he was the first to lap the Indy over 100 mph. 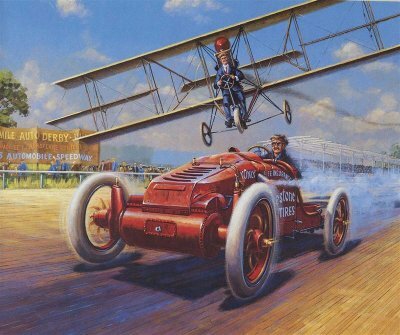 William F. Nolan biography of Barney Oldfield states that the 102,623 mph 1916 Indianapolis lap record was official. The story is that Carl Fisher was concerned with Barney Oldfield safety as the front wheel drive Christie was at least 7 years old and felt it was a death trap and a pile of junk on wheels. Barney Oldfield, still thought she was the fastest sprinter in the country and if he did not break 100 mph he would buy Carl Fisher five new White Stetson’s for the White Stetson Carl Fisher was wearing & Barney was admiring. Carl Fisher said you will probably break your neck but it is a deal. Local Papers described the record run as one of the most spectacular, death defying drives ever seen anywhere. Barney Oldfield risked his life for that Indianapolis lap record and thats American history at its best. I would agree that lap was not easy. Remember the Christie could only go 5 to 10 miles before overheating. So Barney had maybe one lap to get a feel for how much grip he had in the corners. The Christie was bouncing over the slippery, oil soaked bricks with no shocks. Barney had to quickly judge how fast he could take the corners and then let it all hang out for that one 102mph lap. I would compare it to an all out modern qualifying attempt. Barney was not faking it that day. Sometimes he did put on phony exhibitions, but not that day. I will email you the ads that we spoke of. Does anyone know if Barney Oldfield had a riding mechanic when he broke the 100 mph record at IMS and, if so, who it was? I’ve been told it was my late grandfather Eugene Taylor.